The Super Bowl is over for this year. But this is a great snack to add to the table for the many great games to come, whatever the sport. But this is also a snack to have anytime. As a kid, I remember eating snacks like this in Mexico: salty, sour and spicy. This recipe is from a book, (Fiesta at Rick’s), I came across at our local library. It is also easy to make. And I love peanuts! Preheat the oven to 250 degrees Fahrenheit and place a rack in the middle of the oven. In a large bowl, toss the peanuts with the lime juice. Add the ancho chile powder and chipotle powder and toss until evenly covered. Spread them on to a rimmed baking sheet and place them in the oven. Bake for 20-30 minutes, mixing them once or twice as they bake. Once they are out of the oven, let them cool and add them to a large bowl. Toss them with some salt (about 1 teaspoon). While the peanuts are roasting, heat a large skillet. Over medium heat, add the pepitas and toast them until they start to pop. Once they begin to pop, stir them until they are mostly popped, making sure not to burn them. 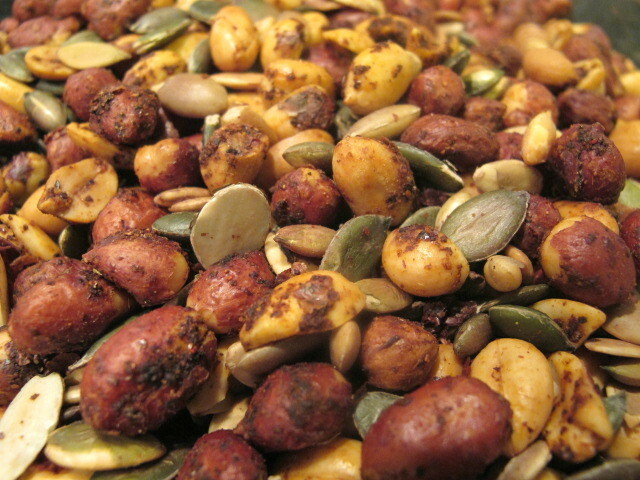 Add to the pepitas to the bowl with the peanuts and toss. Place them in a serving bowl and they are ready to eat!